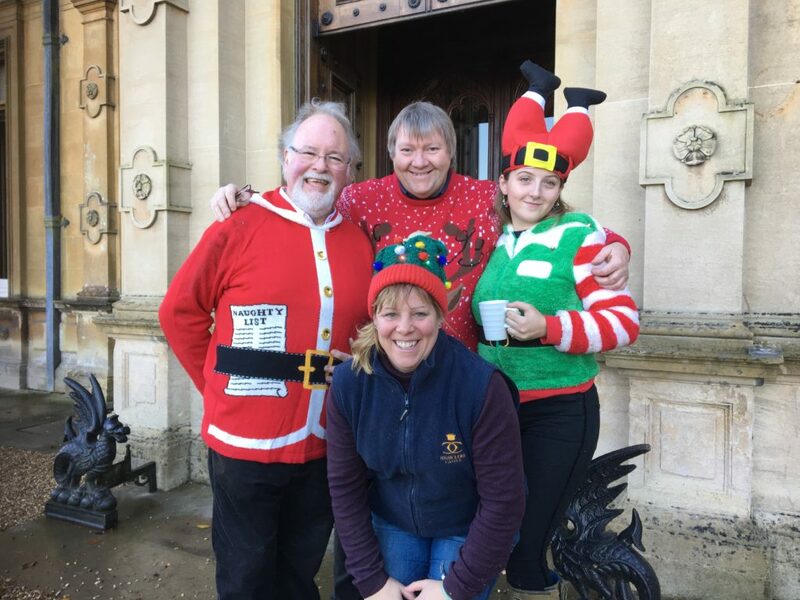 At various times in the year, some of the Highclere team turn into “elves”, of which there are various sorts. The Chief Elf is inevitably Sally in the gift shop and the most recalcitrant elf is John G, the Castle Manager. Elves have a very long and rather mixed history. They were part of old Norse mythology and were usually, and rather appropriately, female. They apparently lived in hills and mounds of stones, which must have been a bit cold in Norway and the other Scandinavian countries. The Swedish “elves” were stunningly beautiful girls who lived in the forest with a king: the sort of story and elves I am sure my husband would prefer. Most agree, however, that any human who watched the dance of the elves would become lost in time and discover that the few hours spent watching were, in fact, many years. Even today, in the real world, it is far too easy to lose track of time so perhaps that was just a handy excuse. Scotland and parts of northern England also retained a belief in elves, probably from sharing a “Viking” ancestry, and James VI of Scotland (who succeeded Elizabeth I as James I of England) was recorded as discussing elves and fairies seriously with Robert Kirk. It was, however, a time of belief in witches with their associated trials which we would utterly condemn today. I myself have also discussed elves but in a far happier setting involving English essays about Shakespeare’s “ A Midsummer Night’s Dream”, where Puck, or Robin Goodfellow as he is also called, causes mayhem but also makes amends. Elves were beings with magical if ambivalent powers who could help or hinder at random but who were endlessly fascinating. As we count down the days to Christmas, and all the different events we are holding, most of us are co-opted as “Sally’s Christmas elves” as there is much to do. Luckily, we are not dressed in green tights with little red tops like the Christmas films, nor do we have pointy ears and odd hats, though we have to work just as hard as the more traditional ones in Santa’s workshop. There is the tree, staircase and tea rooms to decorate, the Christmas Fair to set up and the gift shop to sort out, not to mention all the trees lining the Castle driveway and courtyard. 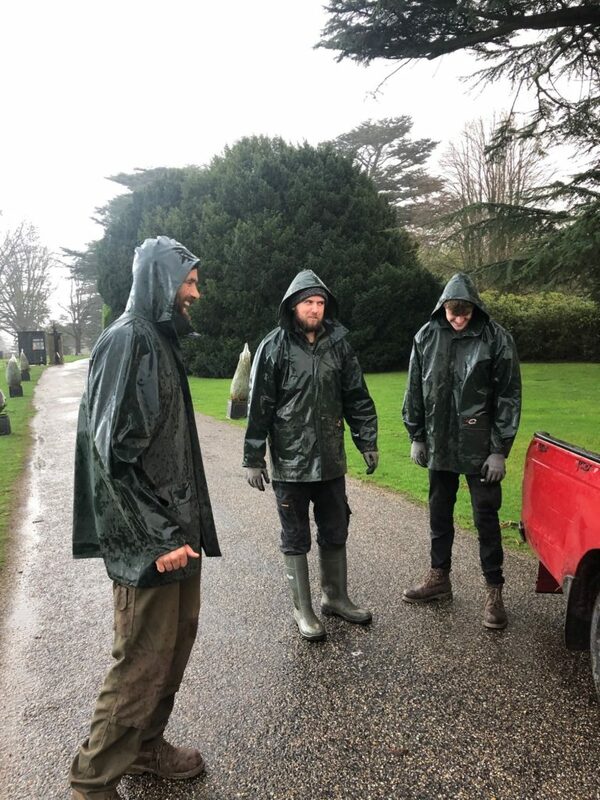 The gardening team are dressed in green of course – but baggy waterproof trousers rather than green leotards. They start early so rather magically by the time we have exited our offices to help, the small Christmas trees are already lining the front drive. 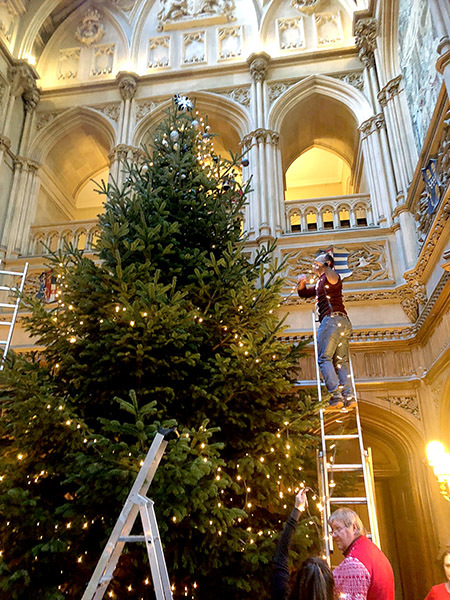 Luis from banqueting, with a rival set of elves, also runs round at great speed preparing the various Castle tearooms to serve all sorts of delicious Christmas Fayre, though he too cannot avoid tree decorating duty. Since John G prefers not to wear interesting Christmas sweaters and, frankly, is not a good elf, most of his office join other elf teams. The only question is – which one? It’s wonderful to read about your Christmas preparations! I hope you enjoy the season and find some time for quiet reflection and enjoying all the beauty. Would love to know the specs on your Christmas tree. It is amazing! It is a beautiful Nordic fir, grown locally, which is a little over 23 feet tall. This year the decorations have an Art Deco 1920s feel and are exquisite. Wow, great memories… last year, The Xmas Carol and Champagne Event… so nice and unforgettable. Thanks for this, Dear Lady Carnarvon and warm greetings from Germany! It is so nice to see Xmas at the Castle. To see the tree in the same room as it was in Downton Abbey, is a grand sight! You followed our inspiration as it works best – they filmed some lovely scenes and I miss Downton at Christmas..
You make me believe in Fairies and Elves. What a lovely thought! The tree is magnificent even before it is decorated. I would imagine the entire Castle smells heavenly from the pine. I miss that. Since we live in Florida, for us a live tree is not an option. I remember meeting Luis two in 2017 in the Tea Room when we visited the Castle. He was exceedingly kind to me. I will look forward to pictures of the completed decorations. I know it will be spectacular. Your blog makes Mondays wonderful for me. Thank you. Maybe an Elf will show up and finish decorating my tree and the house….if not, can I borrow your crew? I’m so glad you enjoyed your visit here. Unfortunately my elves have now moved on to the Christmas Fair preparation so are unavailable for overseas trips! Good Morning. What lovely pictures and such interesting commentary! I wish we could visit Highclere at this lovely time of year. We are just beginning our Christmas preparations after singing in two different holiday concerts for which we have rehearsed since September. We send very best wishes to you and your staff for a splendid holiday season. The tree is amazing! It is going to be so lovely in the entrance hall. Wish I were there, but I am grateful to be there by blog. It is so welcoming. Thank you. Good Morning. It is so interesting to read about elves and their history. Your photos are wonderful also. We send very best wishes to you and your staff for a splendid holiday season. I am sure it’s so beautiful when Christmas Day rolls around. I believe that the Elf who strings the lights should get two extra cookies, two puddings and four hot chocolates ( may need some Rum in one of those)! It’s the hardest Elf duty in my opinion! It is extremely tricky but with 10 foot poles, Sally in charge and a sense of humour we get it done. 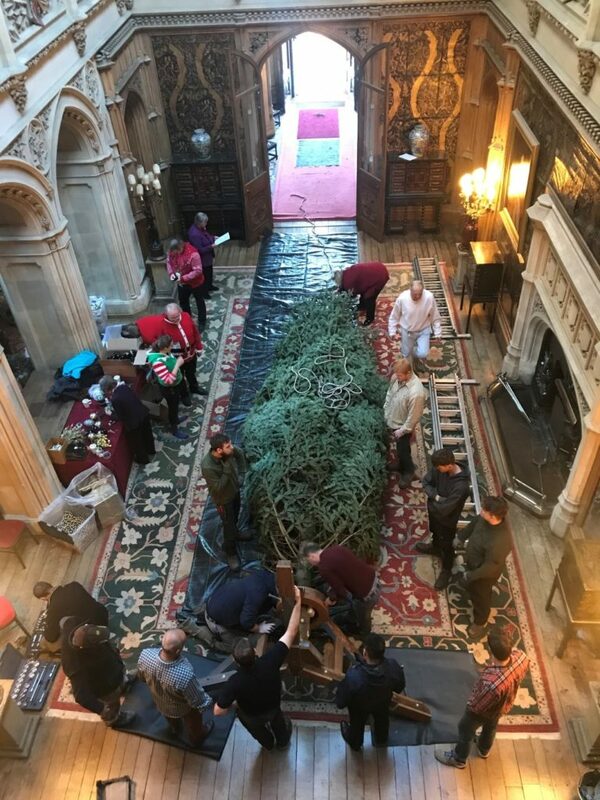 Highclere must be very magical this time of year with all the preparations taking place and the beautiful Christmas tree. What a wonderful, history filled home to celebrate Christmas in. Many blessings to you and your family for a very Merry Christmas and a Happy New Year! I must tell you how much I look forward to Monday morning and catching up on all the latest doings at the Castle! Having my first cup of coffee and enjoying your lovely company. Thank you. I write it with a cup of coffee (cappuccino) by my side too! That “very good tree stump” reminds me of a time when I was about 10 or 11 when I attended Church Grove Elementary school. It had a spacious field behind with lots of old trees whose roots were exposed and I remember going out for recess and digging around at those roots with a stick or a rock to carve out rooms for whatever entity would want to live there. Sadly the school and the trees are gone, replaced by the township fire house, but I like to believe those sprites found a place to roam in the nearby copse of trees along the highway. Have a Happy Christmas and a Blessed New Year! A very merry Christmas to you Lady Carnarvon, your family and to everyone who reads your blog. So lovely. I really enjoy reading your blog. Hopefully, I will be able visit your beautiful home the next time I travel “across the pond”! Merry Christmas! Such fun to know about your decorating the castle for the holidays on such a grand scale. I will look forward to a picture of the finished tree in a future post. It is always great to make light of the work by having all the wonderful elves to help get the job done. Thank you all for spreading the holiday cheer. Many (elven) hands make light work! Deck the halls! What a lovely story about the elves, and also I like seeing Stella looking for fairies in that old tree stump. It is time to get down the Christmas decorations, and your blog today got me all inspired to put on some Christmas music and start to put up the tree! 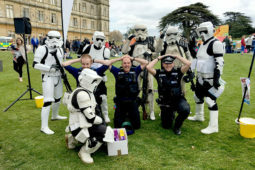 Enjoy the holidays and all the events at Highclere Castle! We always have Christmas music on in the background to get us in a festive mood and the kitchens send us supplies of delicious mince pies to keep our strength up. Big smiles here! I love your Christmas spirit and it comes through in the group photos. The man in the Santa shirt – whatever elf team he is on, is the one I would pick! He really looks like Santa! I enjoyed reading this post and all the pictures of everyone and Stella too. Thank you for raising my holiday spirits, and I wish you all a very merry and warm Christmas season! Thank you. That is Pat, who works in the Estate office. His nickname is indeed Santa as he is full of festive cheer. Ha, wonderful! I love reading your personal replies to everyone’s comments. Thank you so much for taking the time to do it! Thank you so much for all your blogs during the year they are exceptional! Speaking of exceptional I’m sure Highclere must be that at this time of year| I wish a very Merry Christmas to you and your family from the people in Glens Falls New York which is way Upstate not far from the Canadian border. That’s all, of course, extremely beautiful….but it makes me feel tired, sitting here an ocean and continent away from Highclere, just looking at all that work, and I must be turning into my grandmother, since my next thought is “And just who is going to take all that DOWN after Christmas and back up into the attic?????”. I probably l don’t need to emphasize that my grandmother wasn’t known for always looking on the bright side of things. Well, talk about a labor of love, indeed……and it IS beautiful. As for elves? I don’t know how much currency David Sedaris’s writings have in the UK (he’s living there now, having grown up 25 miles from this farm in North Carolina), but are you familiar with his achingly wry/funny essay “The Santaland Diaries”? It his account of working, one holiday season, as a “Christmas Elf” in Macy’s Department Store in Manhattan. He (like Highclere’s “John G”, I gather) was not, to understate the matter, an enthusiastic elf. Do play this recording of Sedaris, reading his story, for your staff and (if you can wrestle him down) John G. It won’t encourage him to be a better elf, but at least he’ll know he’s not alone in looking askance at the role. Thank you David, when I have a quiet moment (rare at this time of the year) I shall seek out David Sedaris. Thanks again David; Mr. Sedaris was definitely worth the time. THANK YOU, DAVID TERRY, MERRY CHRISTMAS FROM BRAZIL. It’s such a magical time of year . The tree in the Saloon is beautiful. I love the smell of a fresh cut Christmas tree. 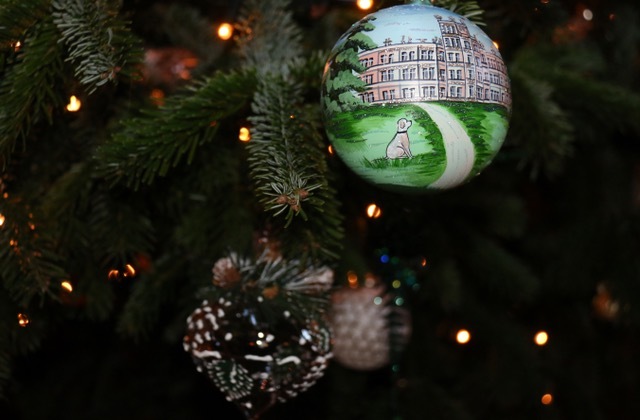 Did you find any vintage Christmas ornaments, from Highclere’s past, tucked away in the attic? I have a selection of Christmas tree glass ornaments that have been passed down in our family. They date back to 1925 and always have a place of honour on our tree. I love that there are ornaments on our tree that once hung on my Grandmother’s Christmas tree when she was a new bride. They’re priceless. We change our decoration scheme each year so we have a load of boxes full of decorations from previous years – I doubt we will ever need to buy another bauble! P.S. 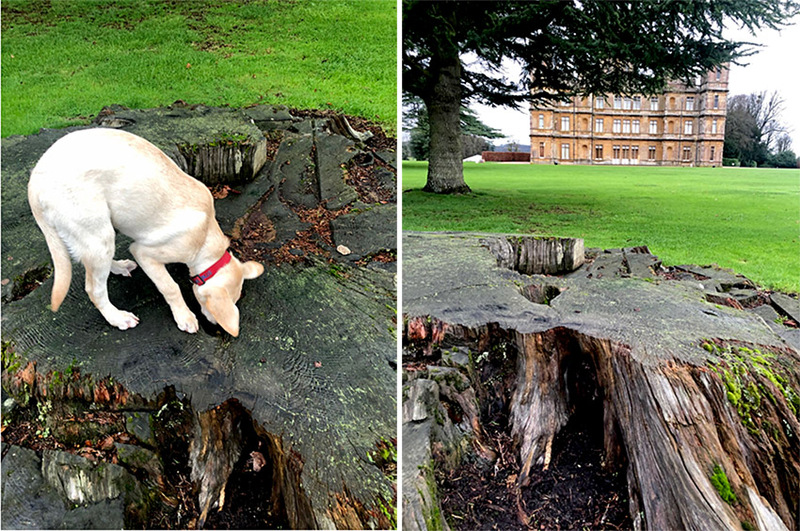 Speaking of old tree-stumps (and some other not-entirely Christmas-y matters)???…. I studied and taught literature for decades, and I very rarely rave about some new novel, but I’ve got to say that Tana French’s just-out “The Witch Elm” is stunning. It’s been a very, very long time since I found myself neglecting all the day’s chores and errands, simply because I don’t want to put down some novel……and simultaneously scolding myself for gobbling it up too quickly. It’s THAT good. You can read reviews (all of them exultant), but you’ll quickly realize that the novel has very little (nothing, in fact) to do with Christmas…….except for probably being a wonderful present (I’ve already ordered six copies). The novel DOES, however, had a great deal to do with a tree stump (and what it contains). You may recall the “real-life” mystery of “Who Put Bella in the Wych Elm?”. In 1943, a skull (and, later, an entire skeleton) was found in an ancient wych elm on the grounds of Hagley Hall (as you’ll know, the seat of the Lyttleton family and Lords Cobham, Worcestshire). Sound familiar??? Tana French updates the story in various ways, including moving the central incident to modern Dublin and an Irish family’s ancestral home. Suffice it to say that it’s a perfect novel for anyone interested in old family houses, tree stumps, and unsolved murders. And now I’ve fulfilled my self-designated role as Book-Recommendation Elf….. Thank you for completing your task, Book Elf David. Now following Tana on my book purchase site. I actually opened my email this morning and felt my heart lift a little when I saw your post. Thank you for this. Have a very, merry Christmas! You too – it is a good time of year! Absolutely cannot wait to see the castle decked out for Christmas next weekend! When I find a pot holder in the refrigerator, or lettuce in the freezer, or kitty toys inside my house slippers, I always blame it on the fairies. Makes sense to me. Such fun! Hmmmm…..where is John G? Actually he was dressed in pastels colours – a very non-elf outfit – and walked round the grass car park contemplating the rain and doing his 10,000 steps. If a lonely elf traveled across the wide Atlantic this time of year, is there an opportunity to visit Highclere? It would be spectacular to experience the Christmas Market and Holiday decorations in person! I would welcome your suggestions and advice. What’s happening on Decemver 18th? Will you please email me with details about the opportunities to visit, and the Christmas Market? I will check on flight options and make plans. Thanks! What a charming and beautiful post! 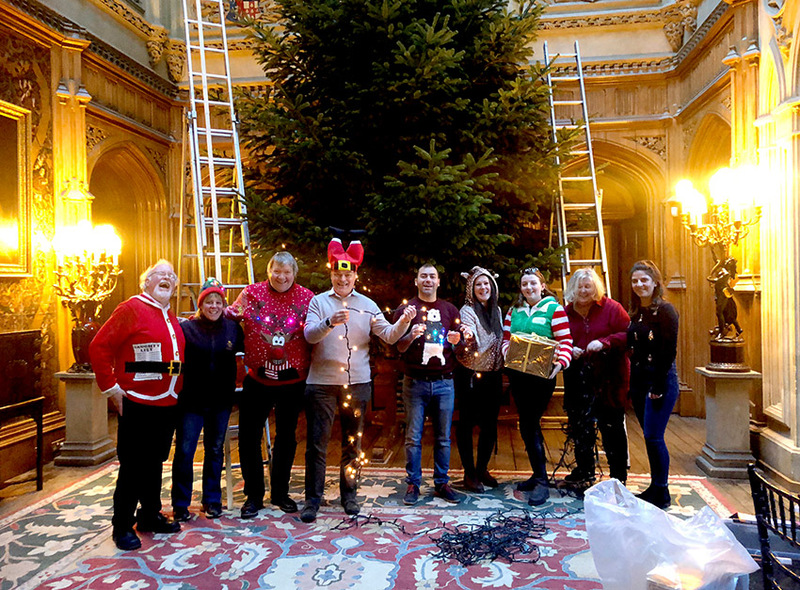 The Highclere elves look so cheerful and festive in their sweaters, and the Christmas tree is truly magnificent. They are clearly nice elves, not naughty elves. Where can I purchase the Highclere ornament? I still dream about visiting Highclere during the Christmas holiday one day. A very merry Christmas to you and yours, Lady Carnarvon!!! Such wonderful decorations! Thank you for posting all that! It feels like christmas is already there. My children and I are driving every year for a weekend to an old stud in Schleswig-Holstein here in Germany around christmas. Whenever we are there, it´s like beeing on Highclere. (We believe so) It´s very beautiful there and we never had such a Christmas mood like there. We also still dream about visiting Highclere next summer. I hope you will visit us – ich have Schleswig Holstein besucht! Es was ganz kalt aber urtümlich – vielleicht ist das nicht das richtige Wort.. I look forward to this blog! In June, I spent a number of hours at Highclere and stood in the back of the castle very near that tree stump. It was a peaceful time for me. It was a beautiful day, flooded with sunshine, a gentle breeze and long flowing grass dancing against my legs. As I walked through the gardens, time stood still. My american home was an ocean away and there were no cell phones jangling and no emails popping and certainly no Facebook notifications to interrupt my thoughts. I don’t know if it because my ancestors are from England or because it is a country I waited 59 years to visit; but I have a strong emotional connection to that beautiful land. I think of the spot at Highclere near that stump almost every day. In the midst of clients, bills and the constant noise of news reports on tv; I travel in my mind back to that beautiful hillside and I am there again walking through the lovely gardens. Thank you for sharing your home with me. And thank you for writing this blog so that I can “visit” over and over again. Merry Christmas to all at Highclere Castle! The highlight of my 6 month “senior sabbatical” was visiting Highclere and actually meeting you and the young pups. I hope you family have a glorious and peaceful Christmas. The tree will be lovely. Once again, you have enriched my day by sharing your life and home, Lady Carnarvon. 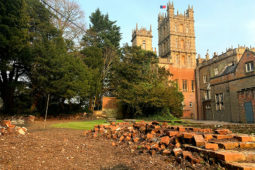 Thank you so much for your faithfulness in reporting on events at Highclere. I particularly enjoy your photos. You are a blessing to me and to many. Merry Christmas and Happy New Year to you all! A beautiful tree in the most beautiful setting! Thank you so much for your wonderful insights into life at Highclere Castle. Although I am new to your blogs, it is fascinating to see how you maintain a family home and are a custodian for future generations. May I wish you and all at the Highclere Estate a Merry Christmas. Your blog gives me great joy especially this one at Christmas time. I can see that you all have a jolly old time together and I do hope you will post pictures of the tree and the rooms when they are decorated. Did I understand you correctly that you light up all the trees that line the driveway? How many trees are there? If that is true then it really must take your breath away. I must come see for myself someday! Merry, Merry Christmas to you, your family and all the dogs and puppies. P.S. I do put up a real tree here in Florida. I could not abide not having one! I will count the trees and report back!! The elves look so cheerful! Happy Christmas! Mele Kalikimaka from Hawaii! I enjoyed reading about your elves and the amazing amount of work they do around Highclere this time of year. Spring was gorgeous at Highclere, but I would love to see it at Christmas. It must be magical! My family and I, from New Jersey (USA), recently attended your Egypt presentation and regrettably, due to our poor planning, had to depart early and before refreshments and the tour of the Egyptian artifacts. The presentation and tour of the castle and meeting you and the Earl were all wonderful and we are so very sorry to have missed the rest. Hopefully we may meet again and we plan to try the Highclere gin and cigars you mentioned to us in while chatting in the gift shop. I hope you will return too! Thank you – we just learnt tonight that the final glass bottle sample is now perfect and we have orders in the USA USA! Ah… Christmas season at Highclere must be magical! Add a little snow falling, the family gathering, children and dogs running everywhere, just bliss! Have fun with the fair this weekend! Enjoy Christmas and the end of year’s celebrations! By the way, the ornement with the castle and the dog is so cute! I have fallen in love with your beautiful castle! I have always loved the Downton Abbey Christmas specials and I imagine that that is what it is like at Holiday time there. So cheerful and festive, thank you for letting so many into your life! Happy Christmas to you all at Highclere! BEAUTIFUL HISTORY. CONGRATULATIONS .MERRY CHRISTMAS FOR MYLADY AND YOUR STAFF. BEWARE CAUTION. HE COMES IN PEACE HE IS A GOOD MAN. MERRY CHRISTMAS AND ONE OF THE BEST NEW YEAR FOR THE EARL AND COUNTESS OF CARNARVON AND FOR ALL OF THE STAFF OF THE CASTLE. 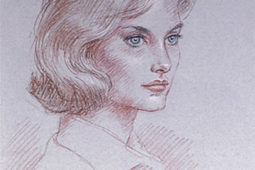 MARIA AUGUSTA PINHEIRO VILA ALEMÃ RIO CLARO. SP BRAZIL . Thank you Maria Augusta – I look forward to the arrival! Thank you for sharing the stories of all the hard work… the tree in the house is wonderful! Your son and little relatives may have outgrown your stories, but why not write them down for other children? With the house and grounds as a background the stories could be quite magical! I think it might be fun to do so – I might incorporate some into my next book! “WITH A PRECIOUS BOOK THAT SHOWS THE MUSEUM THAT _ DID NOT_ CATCH FIRE IN THE CITY OF RIO DE JANEIRO” IN OTHERS WORDS, – IS NOT – THE BOOK OF THE NATIONAL MUSEUM OF THE CITY OF RIO DE JANEIRO LOCATED IN QUINTA DA BOA VISTA, WITH WAS CONSUMOWEB BY FIRE. PROFESSORA MÁRIA AUGUSTA PINHEIRO VILA ALEMÃ RIO CLARO SP BRAZIL. A magical time of the year, and seeing the Christmas tree in person today was a wonderful treat especially with the choir singing carols! A perfect setting. It sounds like the elves have transformed Highclere into a Christmas wonderland!!! Everyone, including you, are to be commended for your hard work. I hope your Christmas at Highclere is enchanting (I know it will be) and I hope some of the elfin magic rubs off on John!! Some people have to be dragged into the Christmas spirit!!! Your tree sounds magical, it sounds as it would have been the perfect prop for the Downton movie- as it is supposed to take place in 1927. I hope you all have a glass of eggnog-or champagne-and enjoy the beauty of the Christmas season. You could always get John drunk on champagne and put him in a merrier mood! !-Just an idea. ACtuallly, John G has tremendous Christmas spirit and a great line in jokes and limericks! As an elf he has too many ripostes..
A wonderful part of the Christmas Season is the coming together of family and friends in preparation and celebration. Your sharing of these festivities is wonderful, thank you. May you and your family have a blessed Christmas and prosperous New Year. It was a lovely trip my friend Sue and I made to Highclere on Thursday, 6th Dec., both coming from different directions of Surrey and West Sussex, we found the journey almost equidistant, arriving with minutes of each other. After a cup of coffee at the Coach House, we ventured back inside for the Xmas retail therapy. The stalls were lovely and the food samples from the Welsh lads were very tasty. Loved the interior of the castle – the hall and it’s balconies in particular – and felt very at home, and the staff were all magnificent. Our only observations were that there could have been more stalls – perhaps in the marquee as an over-spill, and a welcome snifter of a sherry and a mini mince pie, would have been a nice ‘hello’. There is such a Christmas event at Standen House near Rowland’s Castle, who may have been holding Christmas open days for longer, who also provide the thrill of seeing a horse-drawn sleigh (the horses have antlers on – but the children don’t realise) and complete the picture. But we’ll be back on another open day – perhaps experience a sunny day, for better outside photos, which is out of all our control. Thank you. Jill West Sussex. Thank you for your comments and suggestions – we had some more stalls outside but they cancelled (which happens)and I think next year I might have second marquee and we might all make wreaths or table decorations etc I think that would be fun. I think there is more to do and better tweaks every year! Thank you for your wonderful blog posts and for sharing your amazing Castle and stories with all of us. I’ve always wanted to visit a real Castle. I’ve admired Highclere for a long time ever since I first learned of it after researching the Downton series a few years back. my hubby bought me the Highclere replica which sits on my dresser and I light it up. Although, we can’t see the holiday trees and all the fun and glamour inside, I do so through the blog. I resell miniatures/ dollhouses online as a side hobby and always wonder why the manufacturer’s don’t make a Downtown model complete with dolls etc. I live in Florida and hope to visit someday and would love to say hello if you are there and take a picture with you. My husband is an award winning master photographer so it’s sure to be pleasing. Perhaps we can reserve the rental when we can visit sometime. I wish you and your family a very Merry Christmas and a Happy New year! (I am new to your Blog and look forward to reading more articles). Thank you very much – Happy Christmas!